This indicator draws data from the Market Depth (DOM) on the price chart in JForex platform. Thus allowing you to see how many orders and at what prices are waiting for execution. In addition, the overall Ask and Bid Volume of all ticks from Market Depth window is diplayed. 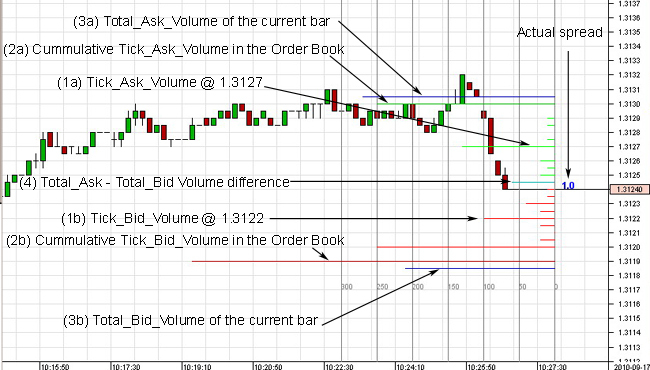 Ask_Volume and Bid_Volume from the current bar, the difference of these volumes as well as the spread are also displayed. Green lines show Ask_Volume, which is visible in the Market Depth window. Line legth indicates the number of orders waiting at each price level (picture(1a)). Dark red line (picture (2b)) shows the cummulative Bid_Volume from the tick from the Market Depth window. Dark green line (picture (2a)) shows the cummulative Ask_Volume from the tick from the Market Depth window. External blue lines (pictures (3b) and (3a)) show Ask_Volume (upper line) and Bid_Volume (bottom line) from the bar (period) from the window, in which the indicator is displayed. The middle line (picture (4)) can have one of two colors: cyan and dark yellow. This line shows the difference between blue lines, that is Ask_Volume and Bid_Volume of the candle. Blue number displayed at the level of the current price shows current spread. This indicator works as a strategy, because Dukascopy does not provide necessary data to indicators. Therefore, when you run Market Depth Chart you have to choose the instrument (e.g. EURUSD). Then the strategy runs in the chart of this instrument. If you have more than one open chart with the same instrument, the strategy will run only in one of them (always the same one). Indicator is best used in small intervals. The downloaded file, the easiest way to upload to the directory … / My Documents / JForex / Strategies. Open strategy tab on JForex platform by Tools -> Strategies. In strategy tab open the file you downloaded. Now you can start FxCraft Market Depth Chart. Instrument – we select an instrument, on which we want to display the indicator (e.g. EURUSD). Shift to the right from now – chart shift to the right from the current time (one unit equals one candle width). Skala (volumen per bar) – chart scale. This number means how many volume units makes one candle width.